The Creative Assembly has announced Total War: Warhammer properly, and released the debut trailer, a CGI affair full of army, unit and hero reveals. It's hugely exciting if you happen to be a fan of both series. On paper, it's a perfect union of lore, studio and technology, and I can't wait to see what the a fantasy setting can do to shake up the Total War formula. Expect magic, huge armies and ridiculous monsters. Here's a round-up of all the Warhammer cameos we've spotted in the trailer. Appearance in a CGI video doesn't guarantee them a spot in the finished game, but studios are careful about the specifics they show. In short, I wouldn't bet against there being Orcs. Lots and lots of Orcs. 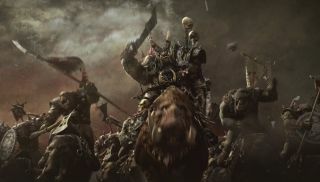 Update: The Creative Assembly have clarified the playable factions in a statement to Videogamer, listing Orks and Goblins, Dwarfs and Vampire Counts It'd be very surprising if the Empire weren't playable given Franz' appearance, but it looks like Chaos will be more of a background menace, perhaps a villainous NPC faction. As the press release says: "a greater threat still whispers in the winds from the north. The fabric of reality itself begins to rend and buckle..."
It wouldn't be Warhammer without the Greenskins. Here's a Warboss leading a squad of boar riders. Boars make tiny mounts for Warhammer's bloodthirsty barbarian race, but the more tusks the better, and an Orc likes anything that can serve as a combat ally and food at the same time. It might seem tricky to fit Orcs—who barely build cities—into Total War's turn-based empire phase, but actually the rules for steppe nomads in Total War: Attila are a great fit. This let the goths and the Huns form impromptu settlements wherever they chose, and encouraged armies to move and pillage to survive. Perfect for a roving Orc Waaaaagh. Here are some Forest Goblins riding Arachnarok spiders, who they worship as gods and use like siege tanks. Goblins normally form smaller units within Orc hordes (who bully them terribly), and tend to be the funniest elements of any army. Night Goblin Fanatics get high on hallucinogenic toadstools and then swing round and round with a huge ball and chain. If you're lucky, they'll plough into the enemy without wrapping themselves round a tree. If you're unlucky they'll go straight into your ranks, killing dozens. There's no sign of them in this trailer, though, and no sign of the Goblins' adorable hungry pets, the bouncy red Squigs. Update: Goblins will indeed be part of the Orc hordes, as is only right. In full view we see the emperor of mankind, Karl Franz, and his lovely big griffon, Deathclaw. 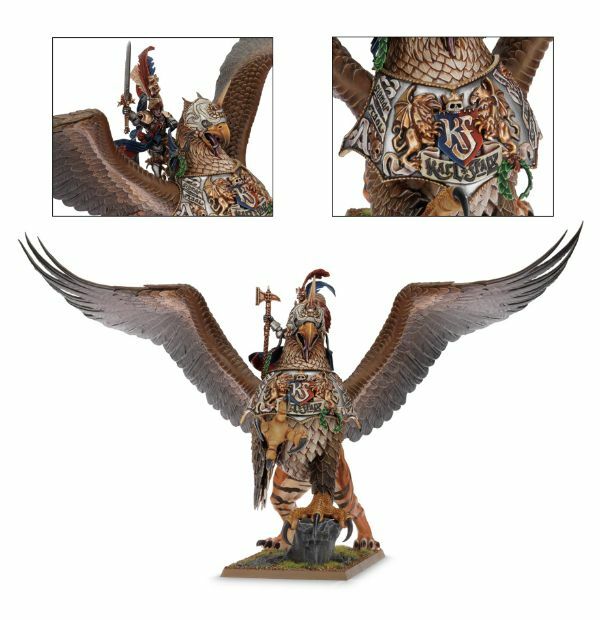 This is a completely faithful rendering of Games Workshop's vision, down to his shiny overwrought crest on the griffon't breastplate. He's holding the Hammer of Sigmar, which will smite you to death if you somehow make it past his pet. KF—don't call him that to his face—leads the mighty Empire, the biggest human faction in the Warhammer universe (there are a bunch of fancy Arthurian knights called the Bretonnians, but they seem to have fallen out of favour with Games Workshop these days). 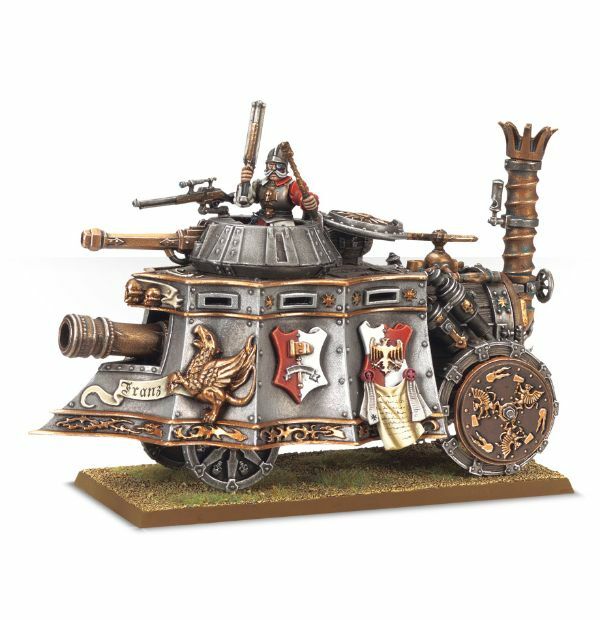 The Empire have a good mix of wizards, peasant fodder, cavalry and machines, like the oh-so-unreliable Steam Tank, and most closely match the sort of armies Total War fans have been warring with since Medieval: Total War. There are eight human schools of magic available to humans in Warhammer, and all have access to absurd spells that can wipe out entire units. The trouble is the winds of magic mages use to power their abilities blow hot and cold. When a spell goes wrong, it goes violently wrong, to the detriment of both the caster and any poor souls standing near them. We don't know yet how far The Creative Assembly will go to recreate the way magic works in the tabletop game, but this big blue meteor suggests that magic will be a serious force, even if they don't go as far as adding the Orc spell that summons the foot of their gods, Gork and Mork, to stamp on enemies. They're Dwarves. You know what Dwarves are like. They live underground, they mine things, build things, drink tankards of ale and braid each other's beards. In the tabletop game mad contraptions like flying gyrocopters and rapid-fire cannons deal decent but unpredictable damage (machines jam a lot in the Warhammer universe) while well armoured footsoldiers soak up irritating amounts of punishment. Their best unit doesn't rely on technology or armour. In fact they don't really wear clothes at all. They run around with big hair and bigger axes looking for Trolls to kill. Slayers FTW. There are a few breeds of vampire kicking about the Warhammer universe. The Von Carsteins are the Hammer horror variety—flamboyant, charismatic, and dangerous. 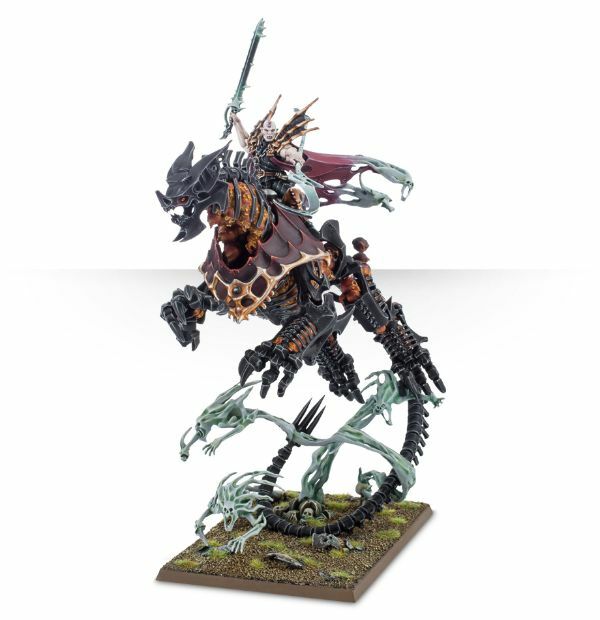 This looks like Mannfred von Carstein, who tends to ride big evil undead things like this haunted robot dog. In the trailer he's gone for a more conventional undead dragon and seems to be leading a throng of undead warriors. Mannfred is trapped in service of the godlike necromancer Nagash, who wants to reap the souls of everyone in the world, starting with the Empire. This guy's a natural nemesis to Karl Franz. I imagine diplomacy between the two will be quite difficult. This gritty HBO reboot of Sam the Eagle is in fact a greater deamon of the chaos god Tzeentch, aka The Lord of Change. The Chaos gods are Warhammer's take on Lovecraft's mythos. These unknowable beings lurk beyond the veil, tempting mortals with promises of power. 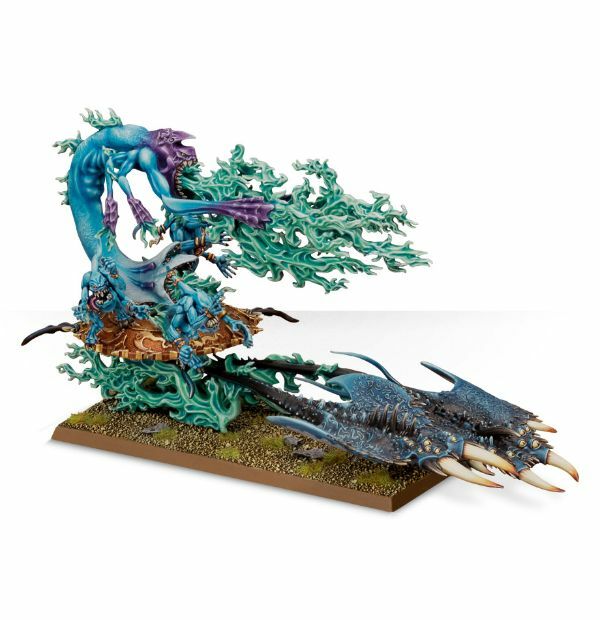 Tzeentch is a slightly unconventional choice (games tend to go for the Khorne's familiar hooves 'n horns vibe), but a promising one considering Tzeentch's love of magic, floating discs and barfing demonic manta-ray chariots. Tzeentch takes over a priest of Sigmar Light wizard (thanks, Shandwen) in the trailer. Will Chaos be a faction in their own right, or will corrupt humans be able to invite demons into battle, desperate to turn back the double threat of the Orcs and Undead? Update: Chaos aren't currently listed as a playable faction, but could still be a NPC army on the world map. Dragons! They're not normally associated with the Orcs, but here they are anyway burning an Imperial city to mulch. You can pick out some Ogres in the foreground. Ogres can serve as their own army in Warhammer, but it's not crazy that Orcs could rope a few of them into a Waaagh. They are sensitive souls, after all, and susceptible to peer pressure. The Total War series is getting better at siege battles with every edition, and this glorious fortress stomp is surely an indication that siege battles will be a significant part of Total War: Warhammer, only now we'll have monsters to smash the walls down, or just fly over them. Defenders' jobs just got harder. Notable by their absence, the Dark, High and Wood flavours of Elf are nowhere to be seen in this particular trailer. Skaven, Lizardmen and a bunch of other armies have also been left out. They may turn up in one of the two standalone expansions planned announced today, and if Total War: Warhammer follows the DLC patterns of recent Total War games, new units could be inserted into each army as DLC. That's about it, I believe, until we see more of the game. Anything we've missed?